Ellen Noble scored impressive cyclocross results in 2017, yet her season was nearly derailed before it even started. Ellen Noble (Aspire Racing) considers herself a dark horse to win Sunday’s USA Cycling elite women’s national cyclocross championships. If everything goes right for her — and her opponents are not on their best day — she believes she can win. “I’m feeling pretty good actually. I had a big change of heart in the last couple of days,” Noble told VeloNews this week. The self-proclaimed “dark horse” designation represents a major upgrade in Noble’s estimation. Noble scored impressive cyclocross results in 2017, yet her season was nearly derailed before it even started. Throughout the spring and summer months, Noble struggled with nutrition problems, brought on by a desire to shed pounds prior to her cyclocross season. In a recent interview with FloBikes Noble discussed the details of the abnormal eating pattern that plagued her 2017 season. In an effort to lose weight over the spring and summer, Noble said she embarked on several crash diets, limiting her calorie intake while maintaining her sizable training loads. She cut out carbohydrates. The diets had a major impact on her performance. By the midpoint of the summer, Noble said she was getting dropped on endurance rides and in road races. Eventually Noble worked with a nutritionist, who helped her develop a proper nutrition program. Still, Noble admits the mental and physical strain were not idea for her pre-season preparation. Noble says she decided to publicly discuss her problem as a way to help other athletes who may embark on intense diets aimed at weight loss. She also said she wanted to stop blaming herself for the problem. Noble turned heads in 2017 on both the domestic and international scene. In September she scored two huge results, first finishing 8th at the World Cup opener in Iowa, and then landing on the podium at the World Cup in Waterloo, Wisconsin. 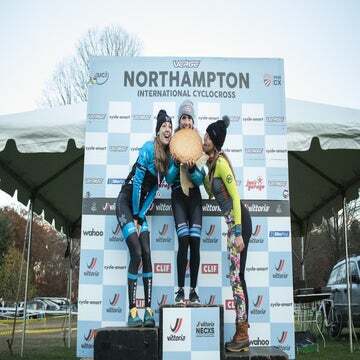 Throughout October and November Noble battled on the U.S. Cup-CX circuit, where she won a round and finished third-place overall. Noble’s results in Europe in November and December were varied. She battled a bout of food poisoning and the usual stresses that come from racing in Europe. She was off the back at two World Cup rounds. Then, on a brisk November day in Hamme, Belgium, Noble beat U.S. champion Katie Compton in the sprint for second at Flandriencross, one of the rounds of Belgium’s DVV Trophy series. “It was a big boost of confidence and also a really great learning experience because racing at the front with Katie [Compton] and Sanne [Cant] is a really stressful thing that I’m thankful to have been able to do,” Noble said. Noble will again face Compton on Sunday, along with her other regular American rival, Kaitlin Keough. Compton and Keough have owned an advantage over Noble throughout 2017. Noble knows that the two will likely battle it out for the victory. But cyclocross’s unpredictable nature — flat tires and crashes are regular occurrences — could always open the door for her. On Sunday, Noble will undoubtedly think about her success in 2017. If she’s able to muster the same form as she had at Waterloo, or at Flandriencross she will most certainly be in the mix for the win. Her positive mentality may just be the final piece that puts it all together.